There's a little bit of a re-brand going on in this here space. Check out the brand new whizz-bang flashy animated header here. 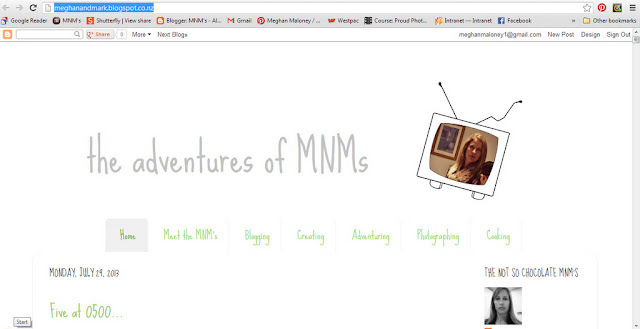 You'll have to be on the full web-enabled version of the site to see it though! And with any luck there will be a custom domain name once it's completed the registration process too - www.mnmsadventures.com - so watch this space! I caved and got me a pair of "wallpaper pants" as a friend aptly described them. Love the design on these ones and they are comfy to wear too - always a bonus! This little guy was stoked to get in the front seat with his good mate Pat - can't you tell?! The verdict seems to be a bit mixed on the new L&P Whittakers white chocolate. Me, personally I love it. I love lemon in anything, I love white chocolate and I love popping candy. Win, win in my books - though I know it's probably not for everyone's palate! I never tire of the beautiful sunrises we get from our place - lucky for me I had a later start at work this particular morning as I had a specialist appointment (checking up on my Crohns) to go to as I would usually have already been at work before the sun even rose! And things on that front seem reasonably settled at the moment which is great, so I've been allowed to reduce my daily dosage of Pentasa (anti-inflammatory specifically for bowel disease) back to 4 tablets instead of 8 a day. Will see how that goes for the next 6 months anyway. We have some of the Glee soundtracks and while I don't really like the lyrics to either Gold Digger (originally a Kanye West song) and Bust A Move (originally by Young MC), the melodies are very catchy and good for creating homie backseat dance move opportunities. I just checked and it's only 10 weeks till our big month long UK trip - which is feeling exciting and nerve wracking in equal instalments right now! We still have a few things to do to get our final itinerary sorted and then the job of what we'll actually take starts in earnest. We bought new luggage (backpack on wheels type ones) in the Kathmandu sale a few weeks back so we're hoping we can maybe get away with just the 2 big packs between four of us on the way over. Time will tell. No doubt we're bound to have a few more updates on the pre-trip plans as the weeks go by! Did I confuse you? You're all saying but the royal baby was a boy or didn't you know? Well we have our own right royal announcement in our family because my brother and his wife (in Melbourne) have told us they are expecting a baby girl at the end of November. And there is a great excitement in our family as it'll be the first girl in this generation. My boys only have one cousin on the other side of the family who is a boy (and is 10 years old ) so any new addition to our small extended family is met with great excitement around these parts! Yay for being able to go and buy some cutie pie pink stuff - squee! Have you ever played with playdough and enjoyed the creating but got fed up with the messy clean-up afterwards? Or been creating with pipe cleaners and wished they were a little more malleable and didn't get stay so kinked afterwards? 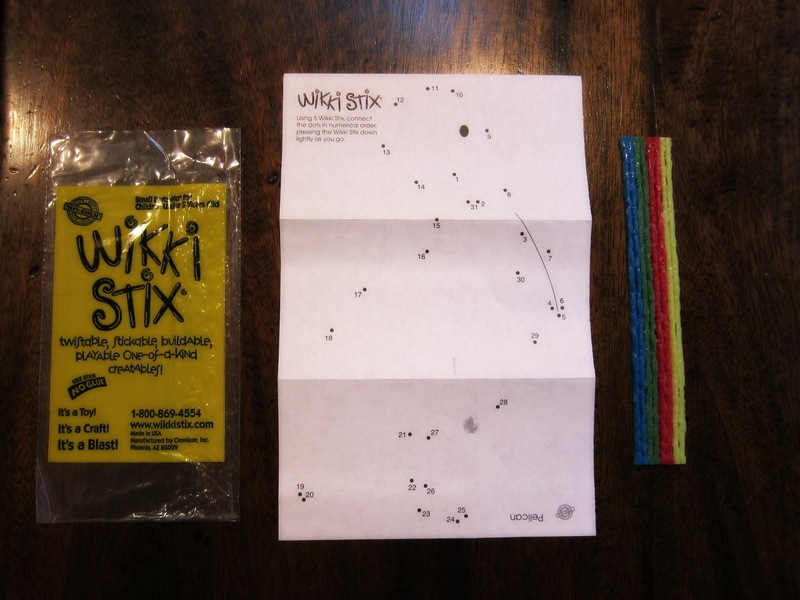 Recently I was contacted by Wikki Stix asking if I would like to do a review for them. And it was an easy decision - any craft that gives you the freedom to let your imagination go wild is good with me! 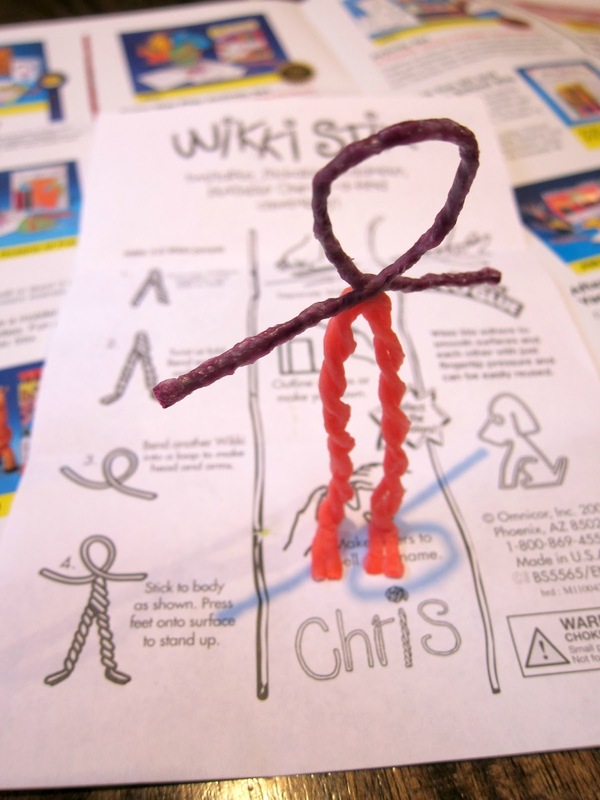 First of all, I think some of you may be asking - what the heck are Wikki Stix? So let me explain! 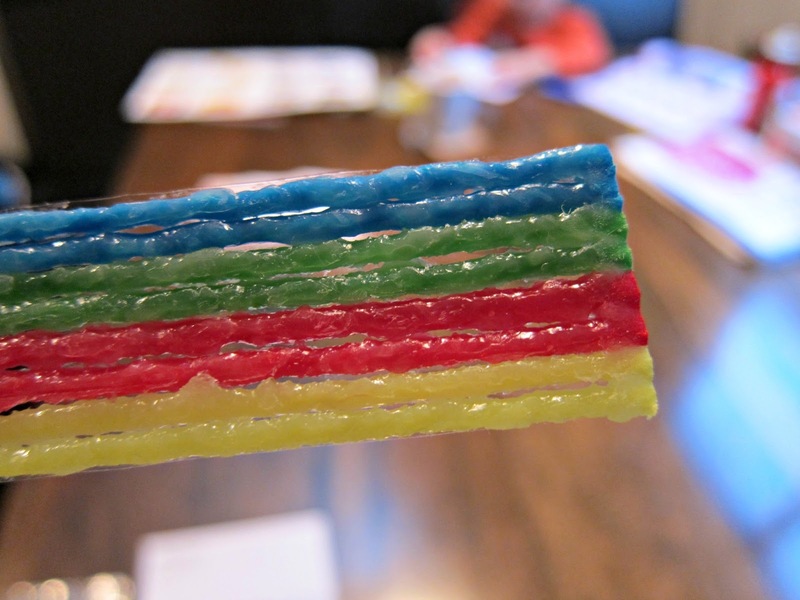 Wikki Stix are colourful pieces of yarn dipped in food-grade safe wax - the kind used in bubble gum and lipstick. 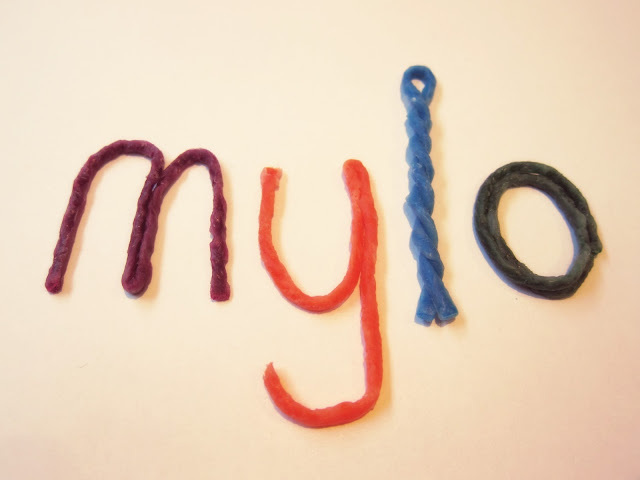 They are non-toxic and gluten-free, making them an ideal creative activity and craft toy for children with allergies. They are bendable and twistable, and once you have finished with one creation, you simply unbend them and you're ready to create the next one. 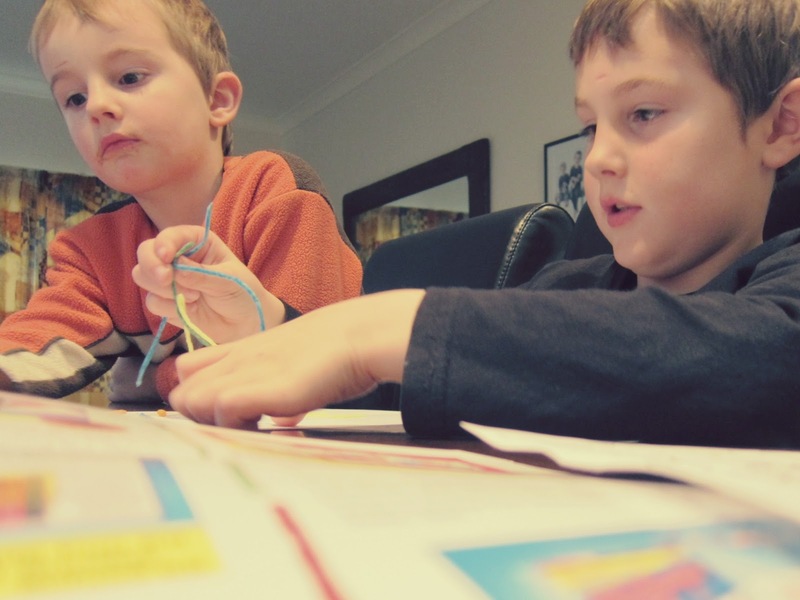 Our Wikki Stix arrived on the last Friday of term on a rainy, cold afternoon that just begged for indoors creativity. So we immediately got to work! 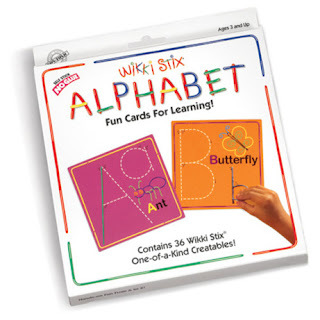 The three packs we received had 8 Wikki Stix in each and came with a template to get the creative juices going - a pelican, a dinosaur and a bird tweeting. 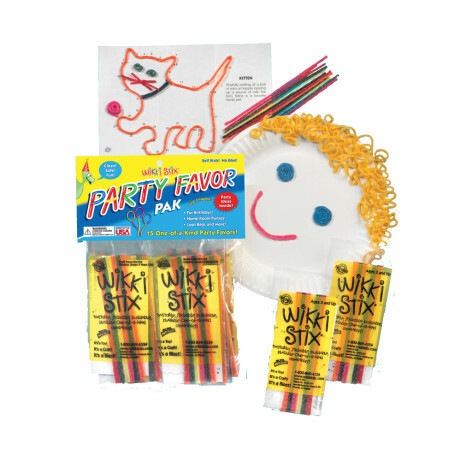 We joined the dots using our Wikki Stix and Voila! a dinosaur soon appeared. And that's when Noah got really excited at the possibilities. 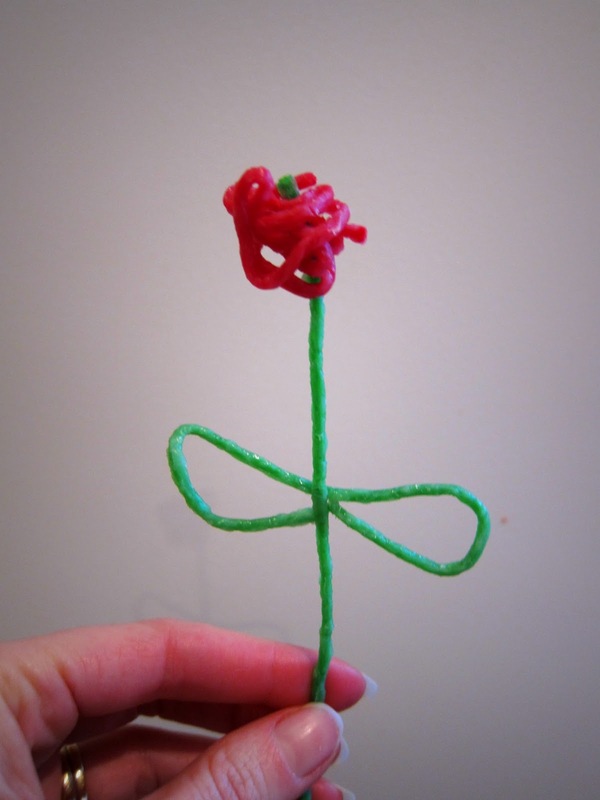 The next thing I knew he'd created a rose for his mum - aww sweet! 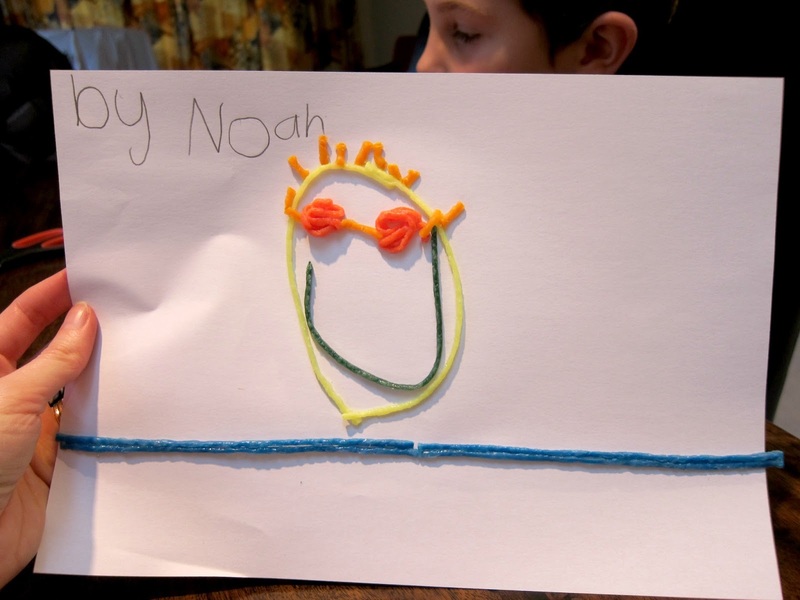 Then he disappeared and came back with a piece of paper and created a cool face. We followed the instructions on the back of the Wikki Stix templates and created our very own people. A request for to 'make our names' followed soon after. 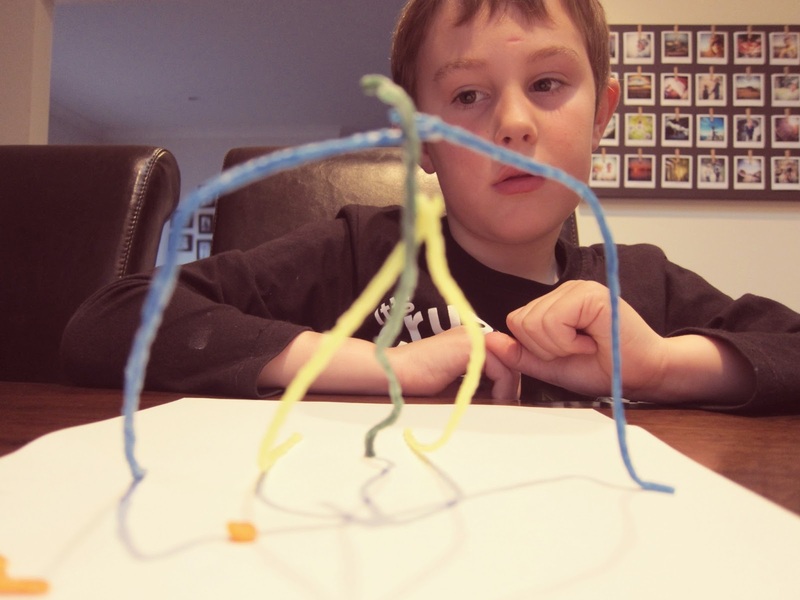 Noah was most impressed at the Wikki Stix ability to stand on their own and decided to create his very own 3-D structure out of them. 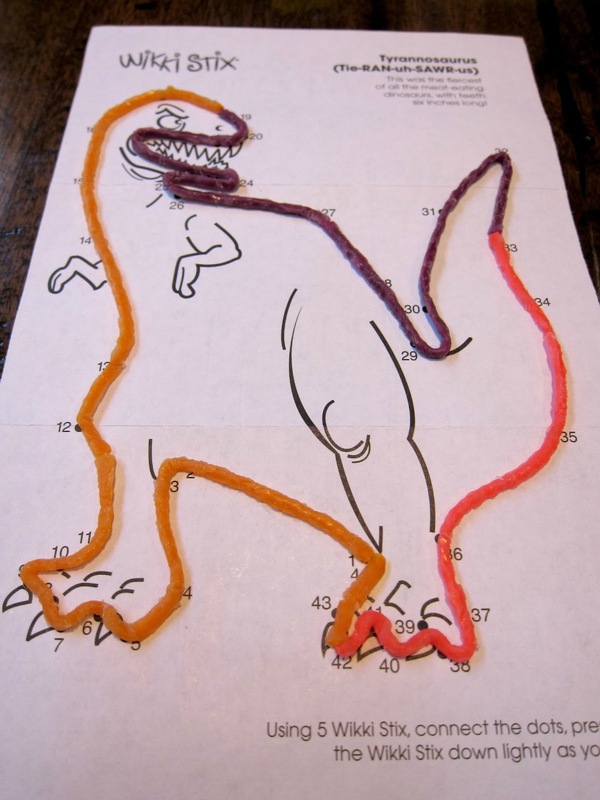 There are so many possibilities for creating with Wikki Stix. Our versions were fairly rudimentary but look at some of the amazing creations others have made. 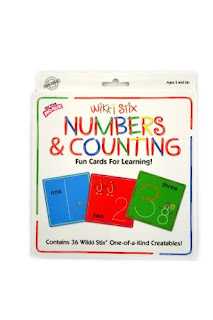 You must go and check out the site for an amazing array of products and resources to use with your Wikki Stix. Like these alphabet and number card sets. 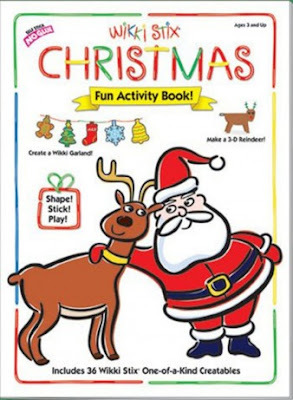 There are themed kits - perfect for Christmas time. Or you might want to bring these out at your next birthday party. I love that the possibilities are endless for imaginative play! If you would like to purchase Wikki Stix, you can do so with a 15% discount on the website by using the special discount code MNMS2013 (in capital letters) and then clicking on Apply Code when you view your cart in the check-out. Shipping is FREE WORLDWIDE too! N.B. I was not paid for this review. I received a free trial pack of Wikki Stix and any views on the product are entirely my own having enjoyed making Wikki Stix creations with my kids. I'm feeling a little unnerved after the past few days if I'm honest. Not the weekend itself. We had a lovely time (albeit short and sweet) away at Gee Gee's in New Plymouth. Driving up after work on Friday night and back home again by 4.30pm Sunday afternoon. Which turns out to be a lot of driving for only one whole day actually there - it's a good 5 and a half hours each way once you take into account a couple of stops on the way. The drive up on Friday night was hard going with fine, misty rain constantly drenching the windscreen and when combined with fog together with oncoming car lights making the journey one of intense concentration for the last few hours. It's a good thing we found a great coffee spot on Saturday morning to refuel the energy supplies. This is the new Federal Store - I'd visited it before when it was Zanziba but boy is it in a whole other league now. Such a cool setting. I bought myself a salad for lunch from there both days as well as the obligatory flat white, mocha and cappucino for us big people. We needed the caffeine for energy as we then added in another 2 hours of driving on Saturday to Stratford for the afternoon to have a look around the Pioneer Village, play in the snow at The Plateau and a meal at the Stratford Mountain House. The first thing we did at Pioneer Village was take a ride on the train - I think we were the only ones at the village so we had the run of the entire place while we were there. The boys enjoyed seeing the model engine up close and personal. We headed into the library and were amazed at the size of the Holy Bible on display. From there we explored the old newspaper and printing presses. Even finding a newspaper from the day the Queen married Prince Phillip on the shelves! The boys imagined what it would have been like to be a student in 1915, sitting in a classrom with desks covered in ink blotches. Interesting to see the kinds of words and script one had to practice with in those days. The Rules for Teachers are a little over the top - amazing to think this was what society expected 100 years ago. Poor Daddy got locked up in the police cells. The boys got the water pump working and enjoyed seeing it gushing out. We imagined how grim life would have been inside this prison cell. A wooden bed in one corner and a bucket for business in the other. Then we were treated to the realities of colonial life in several cottages done out realistically. Mylo found himself in the money inside the old New Plymouth Savings Bank. Gee Gee belted out 'You are my sunshine' on one of the many pianos donated to the museum. Just as an aside, I felt a bit sad over the weekend as once I realised we wouldn't have the room or the money to do up her old piano player, I was hopeful we may have been able to donate it here. But in the meantime, it was taken out of our hands as it has been taken to the dump. I'm so sad that we've lost this piece of family history but I have the happy memories of the time I spent playing it in my youth and this will have to sustain me. We were rather amused to see in a window what must have been an early version of a toddler's potty. And I thought this plaque on the wall was rather interesting and apt. One young villain find himself captured in the village stocks. Inside the re-creation of Stratford Hospital we had fun scaring ourselves silly pulling on a cord which opened this door to a skeleton bobbing around. The boys did this for ages! Noah enjoyed throwing a few rocks in the lake and watching the ripples flow steadily outward. I stumbled upon a reflection of something that seemed quite out of place in these olden times. And loved imagining the life they lived. We had half an hour up our sleeves before dinner so despite the dense cloud around, we figured we'd drive up to The Plateau and see if we could see any snow. The boys were not disappointed. And having come prepared with gloves, hats and gumboots, they kept themselves merrily entertained for a good half an hour. With Daddy watching from the sidelines - that wrist not being able to risk getting wet or knocked! And just at the last minute as we were about to go, the mountain herself appeared through the mist to say hello in all her splendour. We warmed ourselves up at The Mountain House while waiting for our hearty meals to arrive. Driving everyone home afterwards in the dark along deserted country roads in pea-soup thick fog was another test of my nerves and concentration. 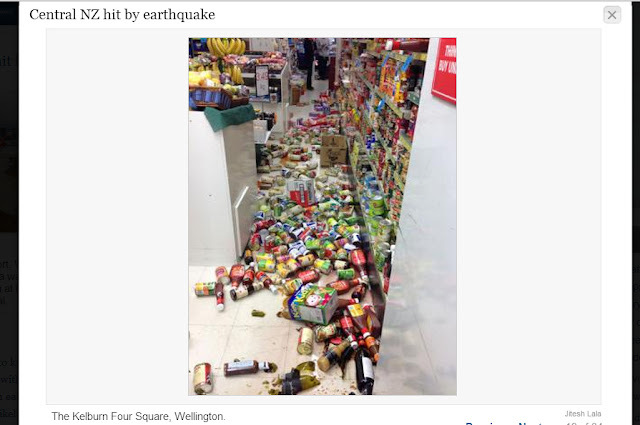 We woke to the feeling of an earthquake at Gee Gees early on Sunday morning - quickly realising it had been another 5.5 magnitude down here in Wellington. We'd had a fairly noticeable one on Friday morning (5.9) and my work building which is on rollers swayed for ages. Mark didn't feel that one as he'd been walking outside. It was an uneventful and quiet trip home Sunday afternoon with the boys merrily entertained with their new 2-player DVD/games console that Daddy scored them on a 1-day sale a while back. At one point I said to Mark 'children, what children?!' - the back seat had never been so quiet and co-operative! We arrived home about 4.30pm and had started the long task of unpacking, sorting out washing, and preparing for the week ahead at work. I think I was chopping up some veges for Mark in the kitchen when the big 6.5 magnitude earthquake hit. 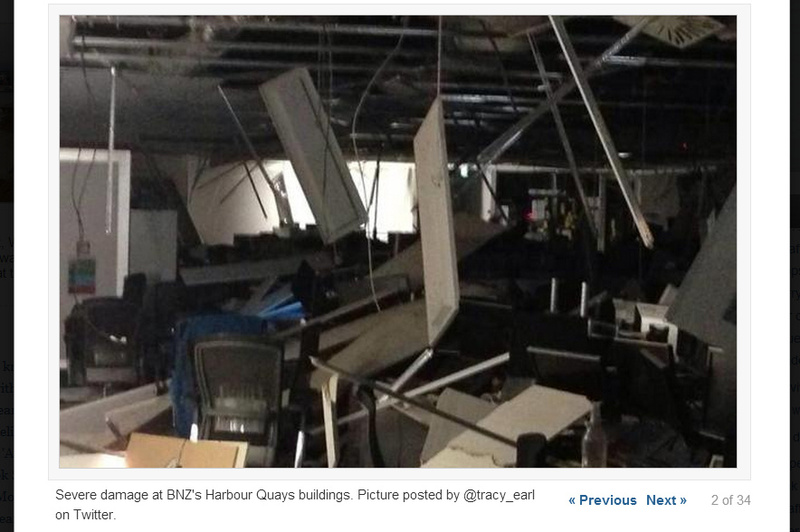 It was like being in the earthquake house simulator at Te Papa as the first jolts started. All four of us ran to the doorway between the lounge and hallway and huddled there. I heard both Mark and I praying and found myself calling out 'Jesus, please help us. Lord keep us safe' as we watched the TV swaying precariously from side to side and heard the sounds of things falling from shelves and breaking, not knowing exactly what it was. Our hearts were all racing and we had a family huddle and cuddle for a few moments afterwards before cautiously going to assess the damage. Unfortunately all the photographs on the top bookshelf fell off and took some china with them. Around the rest of the house things on top of drawers and bookcases had tipped over, but luckily nothing else broke. Giraffey who lives halfway up the stairs also fell down but was more fortunate than the day I knocked him over accidentally while vacuuming. On that occasion he lost his whole head which has since been glued back on again. Down in the garage some large wooden boards fell forward, knocking Mark's bike over onto mine. What I am most grateful of is this little contraption below though. About 2 or 3 years ago, Mark's Dad encouraged us to get something to fix the bookcase to the wall as where it stands it was easy to knock and has always had a bit of a wobble on it. How glad am I we took up that advice! Despite losing 2 bits of china, I honestly think that if it hadn't been attached to the wall so that it could just rock a little, the whole thing would have toppled over which would have been way worse. So we're here, all alive and well, thanks to the grace of God. There has been a bit of damage in the inner city - enough to ask people to steer clear of the CBD until buildings can be assessed. Mylo's daycare (which is on the 1st floor of an inner city apartment block) is closed today, and I am working from home with him. That turned out to be a good call as I found at at 9am that my work had all been sent home again (out in Lower Hutt) as it appeared there might have been some damage to our building which will now need to be assessed). And as a matter of course we will naturally be reassessing all our emergency supplies, filling up the gas bottle on the BBQ, and checking our water supplies again over the next few days. More than anything, I am thanking the Lord for his hand of protection over us and our city these past hours. And holding my beautiful little family a little closer.